This book is the first in English to examine irregular migration from post-Soviet states, focusing in particular on migration to the United States. Due to globalization and the end of the Cold War, citizens of the former Soviet Union are on the move as never before. The political, economic, and social changes that followed the collapse of the Soviet Union resulted in widespread poverty and unemployment and also created a large pool of potential migrants. Thousands of individuals from poor post-Soviet countries migrate to the West in search of better-paid work in an effort to provide for themselves and their families both through legal channels, and in their absence, illegally. In recent years immigration has become a topic of heated debate in many Western countries: the estimated number of undocumented immigrants in the United States has reached 11 million, precipitating a new legislative focus on reforming the immigration system, culminating in the highly controversial Border Protection, Antiterrorism, and Illegal Immigration Control Act passed by the House of Representatives in 2005 but eventually "killed" in the Senate. This book examines all these issues, discussing the reasons for migration, the profile of the migrants, how the process of migration works and how the migrants obtain their U.S. visas, where they work once in the United States and their intentions with regards to their possible return home. This book explores the reality of post-Soviet migration where the mostly well-educated former professionals end up in low-wage unskilled jobs as domestic workers, child care givers, and construction workers, sometimes in exploitative labor situations. 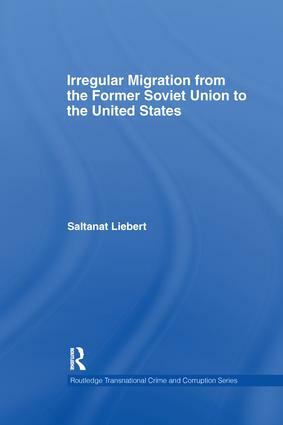 Overall, this book provides a detailed account of post-Soviet illegal migration to the United States, focusing in particular on Central Asian and Georgian migrants, and will be of interest to scholars of US politics as well as Russia, Central Asia,and the Caucasus specialists.